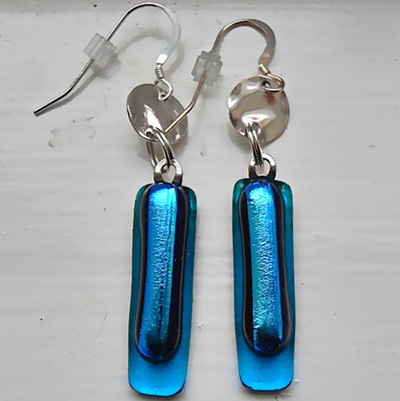 Long elegant earrings made of Turquoise translucent glass and Teal Dichroic glass with small hammered plated silver decorative discs. The earrings measure approx. 6cm x 0.8cm from the top of the Sterling Silver earwires. They're made of two layers of glass. A layer of Turquoise translucent glass topped with a layer of Teal Dichroic glass. The decorative hammered plated silver discs are 1cm in diameter. The earrings come in a Black or Silver card gift box.